DJ Joey A came highly recommended and he DID NOT disappoint! From the first time speaking to him on the phone, we knew Joey was who we wanted to hire for our special day. He immediately sent us all information that we didn't even know we needed. Joey helped with the flow of the whole night and I have heard from many other people that most DJ's do not include this type of service. It just showed how dedicated he is to his work and how much he enjoys doing it. Joey is very in tune with what works for his client's and what doesn't and was always one step ahead of the game. The suggestions he made and help he gave helped us to relax and know the night was going to run smooth with him present. 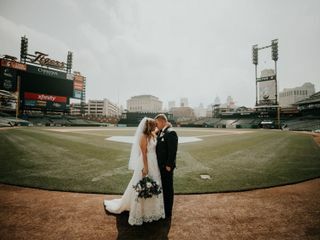 I received numerous compliments from our wedding guests and vendors on how great Joey was on not only our wedding night, but the day as well! From the moment we spoke with Joey, we could instantly tell that he is very passionate about the work he does and we came to find out just how talented he is! He does not treat this as a job, which is comforting especially for couples going through the stress of planning a wedding. I have recommended him to everyone who is looking for a DJ to hire for ANY event. Joey was very kind, professional, and nothing short of amazing. We could not have asked for a better person, Joey is absolutely paramount in this industry! After attending a wedding with DJ Joey A, we knew instantly we had to have him DJ our special day! He did not disappoint! The dance floor was full the entire night! We had the absolute best time and have received countless compliments about how fun the wedding was! Even now, a month later, our friends and family are still talking about it! One of the things we loved about DJ Joey A was how genuinely happy he was for our special day and truly wanted to make it the best day for us. Joey is so much more than a DJ. He also provided our ceremony music and did a phenomenal job. He was so professional throughout the entire process and helped us work through song selections and announcements with ease. He is so knowledgeable and offered suggestions to songs we hadn’t even though of. He helped us create a flow for the evening allowing us to truly relax and enjoy ourselves! We absolutely loved the video he put together as well. We have watched it at least a dozen times! It is such a sweet extra that we will cherish! We have and will continue to recommend DJ Joey A to anyone whether it be a wedding or special event!! Joey definitly made sure our wedding was so much fun! We can truly say it was the best day of our life and we owe it to him! He is so stressfree and helps your day run smooth. He had everyone out on the dance floor for the entire reception! He played such a good variety and reads the crowd very well! We have guests still 2 months after telling us how awesome our dj was! We had the best day and night thanks to you Joey! We would recommend you to everyone!! When Pat and I got engaged, we knew right away that we wanted Joey A as our DJ. I had been in a friends wedding years ago, where he was the DJ and he did such an awesome job, Pat’s sister had him as their DJ and my sister recently tried to get him for her wedding but he was already booked. From the second we met with him, he made us feel super comfortable. Neither one of us had ever booked a DJ for anything so we didn’t know what to expect or even what questions to ask. Joey was super organized and guided us through the whole experience. 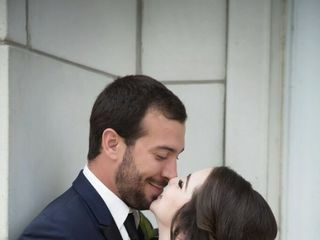 He made us feel at ease with our song choices, time line of our wedding day and just in general about how everything was going to run so smoothly. And he absolutely delivered. Our reception was SO much fun! The dance floor was so packed the entire night. I saw people dancing that I’ve never seen dance before. Joey really plays to your audience to keep them on their feet the entire night. People are still talking about the great music, and memory’s made at our wedding. I would, without a doubt recommend Joey A to anyone getting married. Thank you Joey!!! My fiancé and I first met DJ Joey when we were checking out a wedding venue. He was setting up for a wedding and my fiancé walked over to chat with him. Immediately, we were impressed with his professionalism and passion for his job. He is incredibly genuine and you can tell he just loves what he does! We contacted him shortly after and set up a consultation. Within minutes of the consultation, we knew he was going to be our DJ and make our wedding a great time! The mash up CD he gave us was fantastic — I loved how he mixed up oldies with newer music. On top of DJing, he was videoing and taking pictures of our whole night. We were so impressed with how involved he had gotten our guests as well. We definitely would recommend DJ JOEY to everyone — worth every penny! DJ Joey A was AMAZING to work with. We met with him at our venue, again in person and once more over the phone to ensure that everything was perfect for our big day! The dance floor was packed the entire night. He also took pictures, and video throughout the night. The next day we received a 3 minute video of our reception. It was an added bonus and made me feel better about not having a videographer at our wedding. I would use him over and over again! So many people complimented us on our DJ and his choice of music. You need DJ Joey A for your wedding! What more can I say than you need DJ Joey A for your wedding day! When my husband Mitchell and I were starting to plan our special day, we didn't know where to look when it came to a DJ for the reception. We put out feelers on social media and DJ Joey A's name came up multiple times! I had friends that got married recently and used Joey for their wedding and they all raved about their experience. From the beginning, going over the flow chart of the reception, Joey always responded promptly with any questions or concerns I had which was comforting with all the other wedding planning going on. When it came to the big day, all I can say is WOW. From his professionalism during the whole evening, all the reception festivities flowed smoothly and timely (first dances/speeches/cake cutting/etc), all our guests were happy and dancing the whole night--we couldn't have asked for a better evening. Even when Mitchell and I had some personal issues that came up while planning, Joey was accommodating for those unexpected hardships. That meant so much to Mitchell and I. He is not only a a great entertainer and made our special night amazing, we gained a forever friend. Eastern Market- Best DJ EVER! Joey was amazing to work with! He was so professional throughout the planning experience and helped us in every way possible. Joey had wonderful suggestions for music and put my mind to ease when explaining how the night will run smoothly! 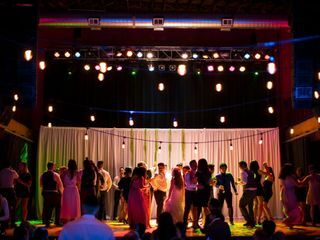 The night went by so fast and so many people danced the night away thanks to Joey's awesome DJ services! My family and friends have been talking about the music since we left Eastern Market. It was a friendly club atmosphere that was appropriate for all ages. We cannot thank Joey enough and I would recommend him to anyone and everyone! DJ Joey A is an industry leader! I met him years ago during my stint in the bar industry, he was our Thursday night guy who always kept the dance floor packed! I knew he was the DJ for my big day, and I am so grateful he was free the day of my wedding. Joey was 100% professional and organized through out all of the preparation process, and organized, cool and collected the day of our wedding. Joey does so much more than DJ, he leads you through your day seamlessly. He was such a huge help that day, and really enabled us to just relax and enjoy our celebration. Joey tailored everything to our tastes and personality, while keeping the party hoppin'! I always hoped my wedding would have a packed dance floor, and Joey delivered. On top of his top notch DJ and MC skills, Joey made an incredibly amazing video montage of the whole day. It was so touching, I am so incredibly happy with it. It brought happy tears to my eyes. I know I will continue to re-watch it fondly for years to come! In addition, if you are looking for a photographer, go with one of Joey's recommendations. Joey hooked us up with Zaneta, and we could not be happier! Zaneta was amazing, great eye for details, setting up great shots, the perfect combo of professionalism and loads of fun! I would also highly recommend booking Zaneta as well if you have the opportunity, you won't be sorry! All I have to say is stop looking—this is your DJ! DJ Joey A was the first vendor we booked after getting engaged knowing he would be amazing after a referral. Amazing doesn’t even describe the service he provided during the preparation prior and on our wedding day. Joey made sure he knew our bridal party and family, selected the songs we liked and created a timeline for our day. We truly had the party of our life thanks to DJ Joey A. I don’t think there was one person in the room sitting down during our reception. You will be more than happy with your choice to have him at your wedding. Thank you DJ Joey A! When you book DJ Joey A, you're getting a lot more than someone playing music and handling the mic. You're getting someone that has extensive experience to help you make sure your reception runs smoothly. With so many things going on during our wedding night, Joey made us feel at ease. He helped us set up our tentative reception schedule (down to the minute) and directed our huge wedding party and primary/secondary sponsors (had over 40 people in that part of the reception alone). He was promptly there for us anytime we had a question or concern. For example, we had a few surprise performances and speeches from family members, but he incorporated it into the program so seamlessly that nobody was able to tell. 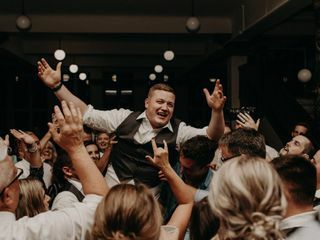 Going into our reception, our worst fear was not being able to enjoy the wedding because of unforeseen issues but Joey's proactiveness enabled us to cherish every second of our special night. The 90's-2000s hip-hop tracks that he spun topped it all off. He even created a video for us! We still have people telling us how amazing our wedding reception was and we credit Joey with a huge part of that. Thank you DJ Joey A! My guests are still talking about our wedding as an all around unforgettable experience! We had fun, every age group was accounted for- and we were on the dance floor the entire night! DJ Joey A was the best thing to happen to our wedding! We originally had hired a band to handle all the music for our wedding, but two weeks before the wedding we found out they were actually only able to play for 2 hours during the reception, leaving us without music for the other 5 hours, including the ceremony! Luckily we found DJ Joey A! Although he was already scheduled at a club, he found someone to cover to personally DJ our wedding, and even worked with our budget. Sensing our stress levels, Joey became a friend instantly by assisting every way he possibly could. He even contacted all our vendors to coordinate and make the day run flawlessly. He is not just a DJ but a therapist/miracle worker/amazing human being. He knew the songs and vibes we were going for even though we didn't, and found our unusual song requests with very little to go off like "that one cover sang by the guy with red hair." 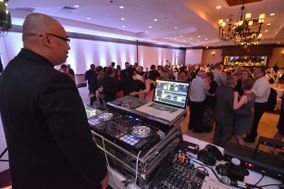 The dance floor was packed then entire time he was mixing, and we received so many rave reviews about him from the guests! I can honestly say that I would never hesitate to hire him again, and he is our only choice for a DJ in the future... even if he was triple the price and became the most expensive option out there! He is worth every single penny and then some! Luckily for everyone, its clear he is not in this for the money, but because he is passionate about his profession and loves to share his talent to ensure your event as stress free and amazing as possible! Joey had another event planned the night of my wedding so he couldn't DJ it but he recommended his partner, Rickey. I went to The Hub to watch Rickey live. As soon as I walked in, I knew that Rickey was a perfect fit for our wedding. He didn't know I was coming to watch him or what my musical tastes were & he played almost every artist on my playlist, from Top 40, to classic dance tunes, to 90s & 2000s hits & hip hop, to Madonna, Michael Jackson, & beyond. He was just as fantastic at the wedding! I had so many guests come up to me at the wedding & tell me how amazing Rickey was! He had the dance floor packed all night long! He played all of the songs on my list, all requests of my guests, & his own selections in the middle. He was smiling all night & looked like he was having a great time too! Joey's event got cancelled so he ended up attending my wedding with Rickey & making a short video of the ceremony & reception, which was absolutely perfect. Joey offered top notch service from the day I hired him. He called me right away to go over all of the details, song choices, timeline, & even offered me a list of the 50 most popular songs for every category/event in the day/evening to help with song choice ideas. We spoke often via email, text, phone & messenger to go over all the details to make sure that our day was perfect. I would hire Joey & Rickey for any event I have in the future in a heartbeat! Thank you for the incredible talent & stellar customer service! Dj Joey A was pneonominal ! I would recommend him if your looking for an amazing Dj for any event ! Thanks again ! DJ Joey and I go back from when he did my sister’s wedding seven years ago, which was the day I said he would be my DJ for my wedding one day. After discovering his talent and skills from my sister’s wedding, my friends and I always enjoyed a night out at Mr. B’s, as we would make sure we went on a Friday, when we knew DJ Joey would be there. After no hesitations or considering other DJ’s, Joey was the very first wedding vendor I reached out to during my wedding planning and I am pleased to say after seven years I kept my word!! On 7.28.2018, my husband and I experienced the greatest day of our lives and DJ Joey has a lot to do with that, and we can never thank him enough. Joey remained professional, attentive to all our questions and needs, and never left us with any worries or concerns during the planning and/or the wedding day. Even when he was busy with other events or a wedding, he always responded that he will get back to me ASAP. Not only does that tell me that he remained loyal to my husband and I, but that also shows that whatever customer he is dealing with at the present moment, is his priority. It is impossible to plan a wedding completely stress-free and you will not always have the most pleasant experience with every single wedding vendor, as I have experienced hands-on. However, I assure that DJ Joey will be that 100% stress-free company, hands down! Joey also hooked us up with a great videographer named Z. She was absolutely phenomenal!! She remained engaged with my husband and I, as well as our bridal party. When choosing a DJ for our wedding our #1 choice was DJ Joey A, we didnt look into any other DJ's, his services were used for our nieces sweet 16 party and we knew then that's who we wanted to use for our wedding. We were looking for someone who would be able to provide services for both our ceremony and reception and he definitely delivered. He was extremely receptive to all of our suggestions for the ceremony and reception. He provided us with a monogram which was very beautiful. He catered to all the different types of crowds that were at the wedding, and he even did announcements for us to remind everyone to sign our guest book and to take a parting gift. The uplighting was beautiful, the music was great all night long and everyone had a great time!! I will definitely recommend him to anyone and everyone!! And I will definitely be using his services in the future!! If you want a DJ who will perform beyond all your expectations then this is the person to use!!! Thank you for being the best DJ possible and for providing excellent service!! You da best! 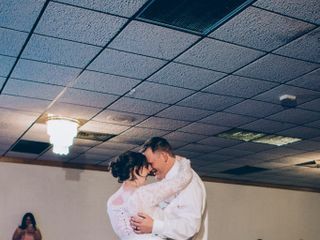 As a bride, my biggest fear was that I would spend a year and a half planning, only to have it fall apart in the last four hours because the DJ didn’t know what they were doing. Nothing is more heartbreaking than attending a wedding that a couple spent their time, money, and effort in planning- just to have an awkward reception where no one dances! I’ve been to these weddings. I had a fear this would BE my wedding. Fortunately for us, we found DJ Joey. Please, do yourself a favor and HIRE DJ JOEY A! I usually like to make a ‘pro and con’ list to figure out decisions - but with DJ Joey A, there are no cons except for the fact that you will be sad your wedding is over - he will make your party such a great success. After two months, we are still getting comments about how much fun our wedding was. We had a multicultural wedding (I’m American, my husband is Mexican), and everyone felt included and the dance floor was never empty once. Can I make myself clearer? HIRE HIM NOW! I have been an actual fan of Joey's for over a decade, back when he had a regular slot on local radio. Imagine my surprise when I realized he DJ'd weddings & the bigger surprise when I realized we had a mutual friend whose wedding he DJ'd & who was gracious enough to refer me to him for our wedding! From day 1, Joey was professional, easy-going, & so very helpful. His services were more than a DJ, but also that of a wedding planner. Joey did two site walk-throughs & created the flow chart for our entire day. Without him & his knowledge & creativity, our wedding day would have been way-less-organized & amazing. 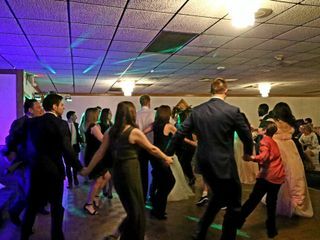 We're still receiving compliments on the music selection & Joey's ability to keep the dance floor full & our guests boogie-ing all night long; not to mention the compliments on his wonderful videography & aerial photography. I've referred many couples to Joey & will continue to do so because, to us, he is, was, & always will be the best DJ around! DJ Joey A was probably the best I booked for my wedding. Not only is he an amazing DJ and knows how to read the crowd and get them hype, but he also is like a wedding planner making sure we were coordinated and on time for dinner and speeches and dances. I had English and Spanish music and he blended the genres so perfectly. He also helped me in things that I didn't even think about or forgot and gave me confidence when I was worried something may go wrong. He is so easy to get a hold of and responds to every and all questions the same or next day. He also does a one-on-one meeting a few months before the event. I am so happy I booked him and if I did it all over again I would book him again and again. He also does a video which was amazing since I didn't book a videographer and he gave me a copy at no extra cost. I loved having him at my wedding. Where do I even begin! Joey is an amazing guy and an even more amazing DJ, he was so helpful with everything always returned our phone calls and always made us feel like we were top priority! He knows how to really read the crowd and keep the dance floor packed! Absolutely amazing all around and you will not regret it! I will be telling everyone about him! Thank you Joey! You’re awesome!!! DjJoeyA was the BEST DEEJAY! I would recommend him to anyone! He made our whole night run smooth, it wouldn’t have been the same without him! We have had so many compliments on how awesome he was, how he made people get up out of their seat and dance when they don’t normally dance! He had the whole crowd moving and grooving all night! He was on point with each stage of the reception, keeping us on track when we needed to be with the garter toss and speeches etc. I want to have another party just so he can Deejay it! And talk about professional, he is a true master at his craft! Thank you thank you thank you DjJoeyA, you are amazing! We were so lucky to find Joey! He was so responsive and willing to answer all of our questions. 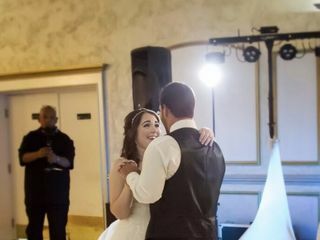 He is a true professional and an awesome DJ and we couldn't have found a better guy for our big day! Thank you! !